One of the biggest risks for seniors is falling, which becomes an even greater hazard in the dark. For aging adults, the risk of falling is even more heightened by reduced eyesight, loss of balance and mobility, and slower reaction times. Proper indoor and outdoor lighting is absolutely essential for those who wish to age in place and live a safe, independent life. It is important to assess your current indoor and outdoor lighting to identify areas that need more light or a different kind of light. From a night lights that gets you safely to the bathroom to exterior lights with motion sensors, here is our list of best night lights for seniors. 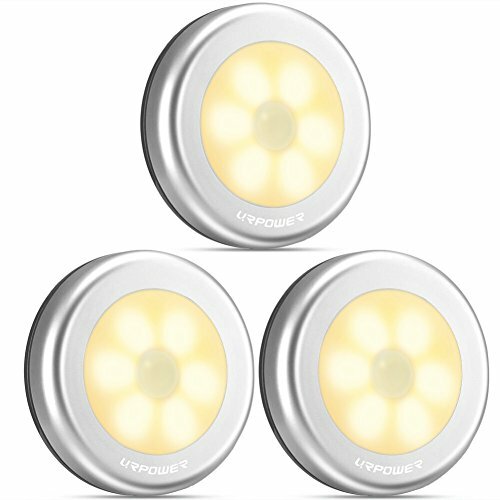 What Type Of Motion Detector Night Lights Are Right For You? 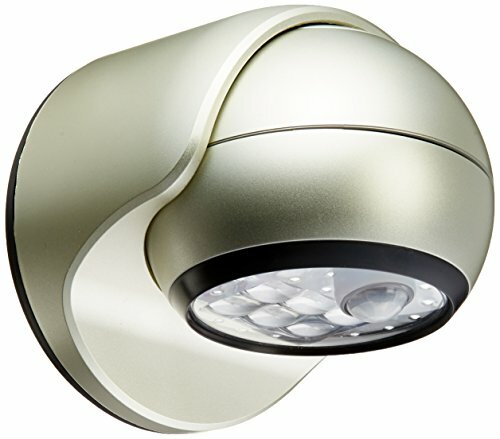 These motion sensing lights are a great option for indoors and outdoors. 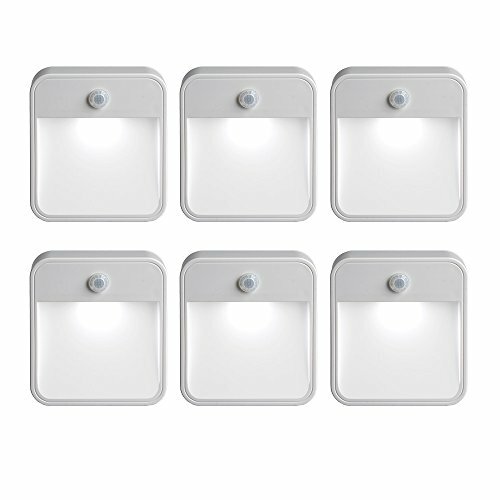 They are easy to install and put off an excellent amount of light. These lights are ideal for both indoor and outdoor use. They are battery operated, cordless, and easy to install anywhere, even where electricity is not available They are incredibly bright with a 20-lumen output and they sense motion within 10 feet, shutting off after 15 seconds of no motion being detected, which extends the life of the batteries. The ease of use make these ideal for seniors. They can be a helpful addition anywhere a nightlight would be useful, from the hallway, staircase, garage, kitchen and more. They are also easy to install because they have built-in magnets and come with double-sided adhesives, so you do not need to worry about drilling any holes in the wall. They only come on in the dark, so no battery life is wasted during the day or when the light sensor detects enough light. We love these lights for their easy to install design and how small they are. This makes these great for stairs and hallways. 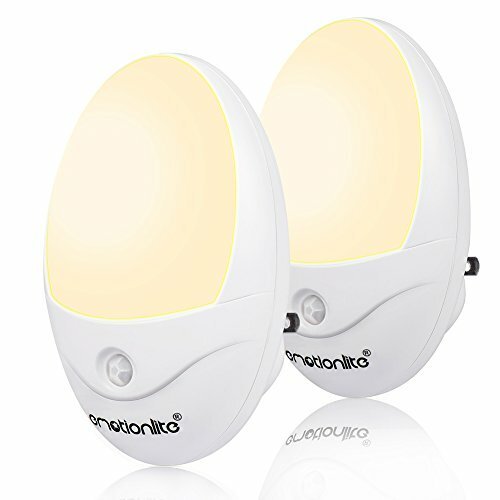 These motion sensing lights are also ideal for indoor and outdoor use as they are battery operated and can be stuck anywhere. They provide a great solution for poorly lit stairs and sidewalks, making them a perfect solution for areas where seniors are at greater risk of falling. They come in a pack of six that you can stagger along the area in need of light. They are tiny which makes them great for any area, and they are motion sensing so they will turn on as you are making your way up or down the stars. They sense motion within 15 feet and shut off after 30 seconds of inactivity. They require no hardwiring, and each one runs on four AA batteries. Each light has an estimated life of 50,000 hours. The Mr. Beams lights can also be used outdoors because they are weather resistant. This light swivels and adjusts to point exactly where you want it. It can be used indoors and outdoors. This light is incredibly versatile because it can go inside and outside. The lamp rotates 360 degrees, so you can point the light exactly where you need it, making this light ideal for outdoor use. The LED bulbs are battery operated with the potential to run for 50,000 hours. It also senses motion and only comes on in the dark. This means that it will not turn on during the day even if it detects motion, but it will at night. The light detects movement up to 15 feet away and turns off after 30 seconds of inactivity. This light offers two forms of installation depending on where you will need it. If you are installing it outdoors, you will have to drill and screw it into the side of your home or a fence, but if you are installing it indoors, you can still use double sided tape with no issue. The unit runs on three AA batteries. These lights go anywhere you need them and they are easy to install. They put off an excellent amount of light and the motion sensing works perfectly. 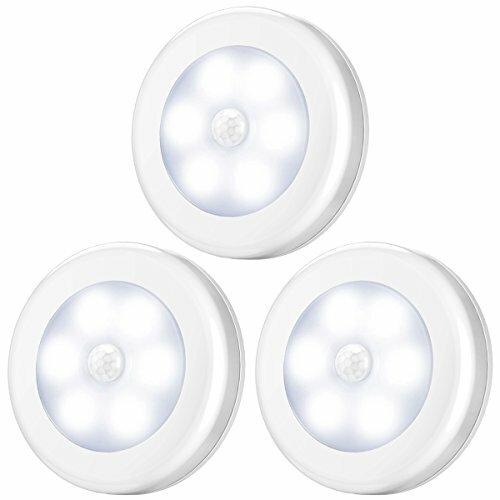 These lights are great for lighting up any area in the house that gets dark at night, making them a great option for seniors who require frequent trips to the bathroom or live on more than one floor and need to light a staircase The pack includes 3 lights that are battery powered, motion sensing, and easy to install. You stick them to the wall using double-sided tape so they do not require any hardware or drilling, and anyone can easily do it. The bulbs are 20 lumens and last up to 10,000 hours. We recommend these lights for hallways and stairs. The Light It! Is the perfect option for outdoors because it is adjustable and completely waterproof. We wish it was a bit brighter. We like this light for the outdoors. It swivels nicely and can point in any direction that you want. It is also motion activated and provides light up to 25 feet away, making it a great choice for seniors who need a lighting solution in the driveway or as they approach their house at night. 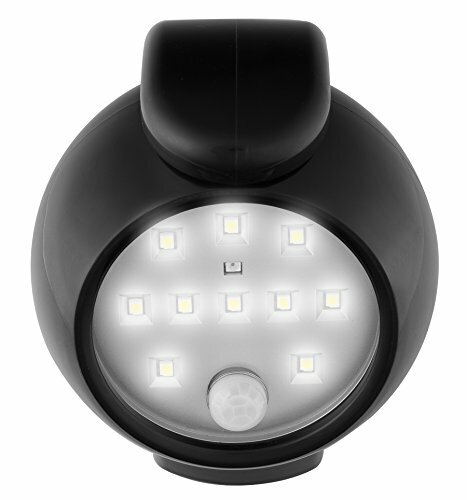 The key feature that makes this light perfect for outdoor use is the fact that it is 100% waterproof. The LED bulbs are reported to run for up to100,000 hours, depending on usage, making them a great option for seniors because of their low maintenance. The only thing that disappointed a little was the overall brightness of the light. We found that this light did not give off as much light as a standard porch bulb, which was a bit disappointing. These are a warm night light that plugs directly into the wall. They are bright enough but they do not turn on until you are directly in front of the light. [ENERGY EFFICIENT]: 0.6W LED, less than 30 cents cost for annual power consumption. These night lights with motion sensors are more typical indoor night lights. They plug right into the wall outlet and throw off a soft, warm light at night, making them a great choice for seniors who need to get up frequently during the night. They are motion sensing, so they turn on when detecting motion within 10 feet, and they shut off after 25 seconds of inactivity. The bulbs are energy efficient and they come with a 50,000-hour lifespan and a one-year warranty. The downside of this light is that it doesn’t pick up movement at an angle. This means that it does not turn on until you are directly in front of it, which could be hazardous. These bulbs are a great solution for those who don’t want to add lights and want to use the fixtures in their home. PIR Motion Activated Light Bulb - 12W/E26; Input Voltage:AC100-240V; Cold White:6000K; Lumen:1000lm; 120 beam angle. 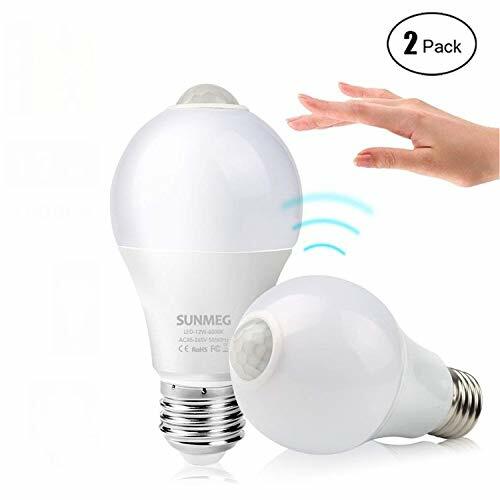 Motion sensing bulbs are a great solution for seniors who already have light fixtures outdoors and may not want to add lights.These 12-watt bulbs are energy efficient and put out 1000 lumens, so they are bright and do not use a lot of electricity. The bulbs work well indoors and outdoors and detect motion within 120 degrees and up to 20 feet away. The bulbs remain on until there is no more motion within range. Keep in mind that the type of fixture you have can impact the range of the bulbs. If you have the bulbs in a glass enclosure, it can decrease the range. This is not exactly a major purchase, but it is something that can positively impact your life as you pursue an independent life. Having a proper night light could be lifesaving for a senior by preventing falls and injury when alone at night. Take some time to walk around your home with a caregiver or loved one while you determine what you may need on the exterior of your home. We recommend investing in lights that can be permanently mounted with screws to avoid an instance when adhesive becomes weak or compromised. Then do the same thing inside your home. Take stock of each area that you need lighting and make sure that you select lights that adequate range, brightness, and can be installed where they are needed. This is the major question you have to ask yourself. Where are you putting your lights? If you want a motion sensor light for indoors, you do not need to worry about getting something weatherproof, and you do not need anything overly bright either. For an indoor hallway, 10-20 lumens would do the trick for you. If you need a hallway light, you also want to go for something small and easy to install. A battery powered light that sticks to the wall should do the trick. If you are getting something for the outside of your home, you want to shoot for 30 lumens or more. Also, make sure that the exterior light is adjustable, so you can point it in the direction you need it. This is a debate for a lot of things, and it depends on your skill level and what will provide a safe, lasting solution.. You also want to think about how permanent the light is. If you believe that the light is perfect in its location and you will never want to remove it, then go ahead and hardwire it. There are a lot of benefits to using battery powered lights with an adhesive backing in that there are no limitations as far as where they can be used, they last a long time with little maintenance, and they are easy for seniors of all skills and ability levels to install. They don’t require any hardware and you can move the light if you decide the location is not right or you want to have a nightlight somewhere else. Once you hardwire the light there, you are stuck with it. Depending on your location you may want to get a light with a long detection range. This is useful for the outdoors or large open rooms like basements. If you plan on putting these lights in a hallway or bathroom, you do not need to worry about having much range. The typical range of lights like these is 10-15 feet , which is appropriate for most indoor situations. Just pay attention to this factor andmake sure you are getting the right light for you. It is imperative that seniors aging in place take all of the necessary steps to make their homes safe and healthy. One of the greatest risk factors they face is falling, which can be reduced substantially when proper night lights are present both inside and outside the home. Take a few minutes to thoroughly assess your own living situation and take some of these tips and products into account when making a decision that is right for you.